Teletronics' fixed wireless network solutions use advanced digital wireless technology to provide voice and data services. 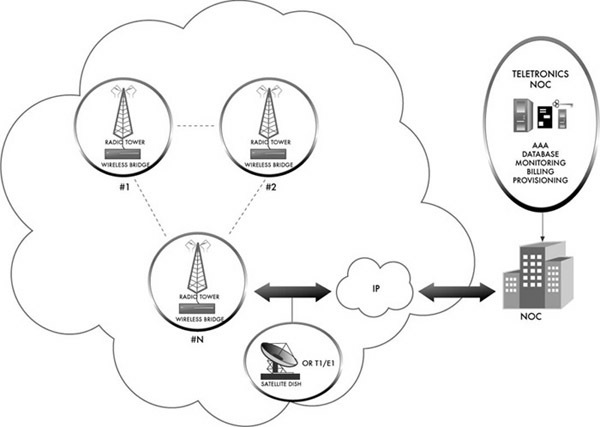 The fixed wireless network, or wireless local loop, is the ability to provide network users access to voice and data networks through the use of wireless radio technology instead of traditional copper or fiber wire. Fixed wireless access has several advantages over the traditional wire-line service, including lower costs, faster deployment, and the ability to grow a network as market demand increases. Solutions include fixed wireless access points and bridges, VoIP gateways, antenna systems, and a Network Operational Center (NOC). End-users will be provided with robust, reliable connectivity and the high performance of wired LANs, but with the flexibility, mobility, and attractive cost of wireless. Network users that do business on the Internet face ever-growing security threats. 1. Authenticate network users with strong authentication techniques before granting access. 2. Ensure the privacy and integrity of communications over private networks via VPN. 3. Protect internal network addressing schemes and clone MAC addresses. 4. Deliver detailed logging and accounting information on all communication attempts. Teletronics' Private Network Services are the choice of Middle East Countries for integrating voice and data networks into one converged network. Teletronics Private Networks seamlessly integrate delay-sensitive voice with data traffic on the IP intranet providing managed, high quality communications. sites of a village/campus connected via radio towers. Network Operating Center (NOC) Hardware and Software manages all voice and data access gateways or nodes in provisioning, configuration, authentication, authorization, accounting (AAA), billing, credit card processing, and networking monitoring of a given private network. © Copyright 2011 Teletronics International Inc.